Maine-ly Drizzle's olive wood smoked olive oil adds depth of flavor to a simple roast chicken, while a salsa made from three types of citrus fruit lends a bright, refreshing note. 1 free-range chicken, about 3 1/2 lb. To roast the chicken, preheat an oven to 375°F. Using a sharp knife or kitchen shears, cut along both sides of the chicken’s backbone and discard it. Flatten the chicken and cut it in half through the breast so you have 2 halves—each with a leg and breast. Rub all over with some of the smoked olive oil, ensuring it gets in all the crevices. Season all over with salt and pepper. Set a large roasting pan over 2 burners and heat over medium-high heat. When the pan is hot, add the chicken halves, skin side down, and sear for 4 to 5 minutes. Turn the chicken over, add the potatoes to the pan and drizzle with more smoked olive oil. Season with salt and pepper. Transfer to the oven and roast until an instant-read thermometer inserted in the joint between the thigh and drumstick registers 160° to 165°F, about 45 minutes. The potatoes should be golden on the outsideand tender in the middle. Remove from the oven and allow the chicken to rest for 5 minutes. To make the citrus salsa, use a sharp knife to cut away the rind and pith from the limes, orange and grapefruit. Holding the fruit over a bowl, carefully cut between the membranes to free the segments. Let the juices and segments fall into the bowl. Add the extra-virgin olive oil and season with salt and pepper. Use a mandoline or a sharp knife to cut the radishes into very fine matchsticks. Fold them into the citrus salsa and add the chives. 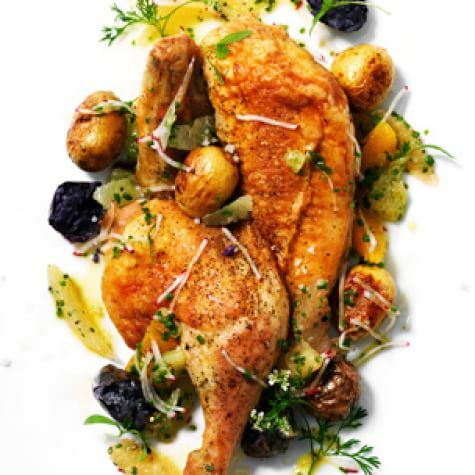 Serve the roasted chicken with the potatoes and citrus salsa, and garnish with flowering cilantro. Season with fleur de sel. Serves 2 to 4.